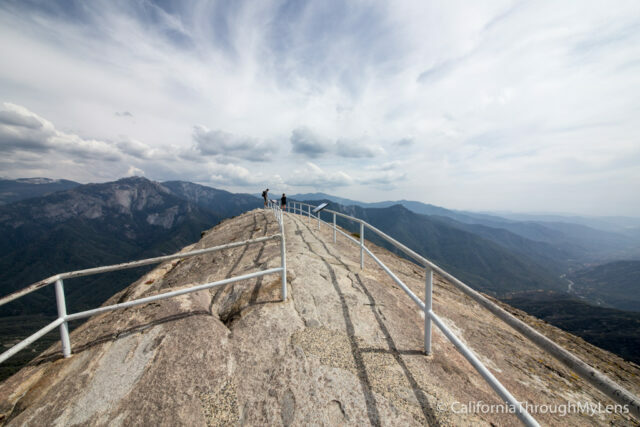 Much like Yosemite has Half Dome, Sequoia National Park has Moro Rock. 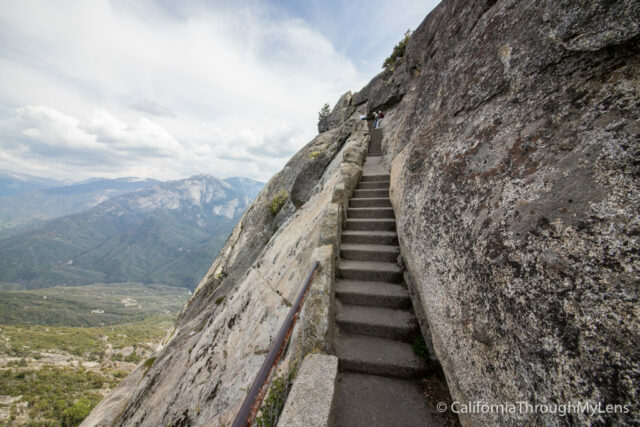 While nowhere near as daunting, it is still an awesome way to get your adrenaline going and see an amazing view of the park, all with less than a mile of trail. 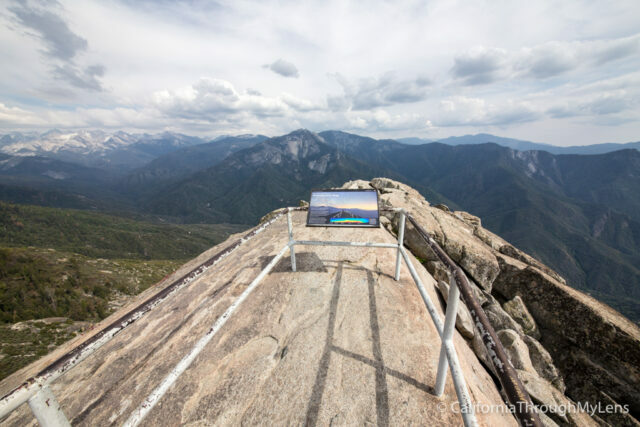 When you enter Sequoia National Park from the South side you will be greeted by Moro Rock standing tall in the distance. 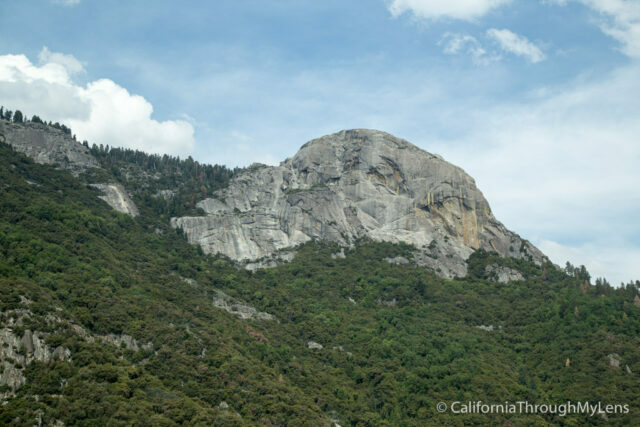 This large domed slab of granite is one of the most popular attractions in the park and rightly so, it is an easy hike that gives you a fantastic view of the entire valley and I highly recommend it on any trip to the park. 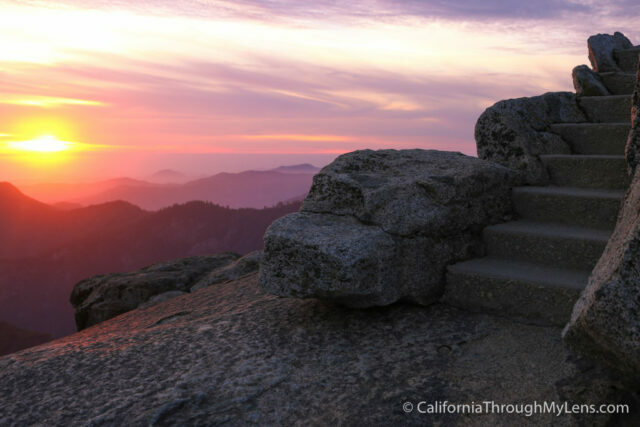 This post has been updated with information seeing the rock at sunset and at night as well. 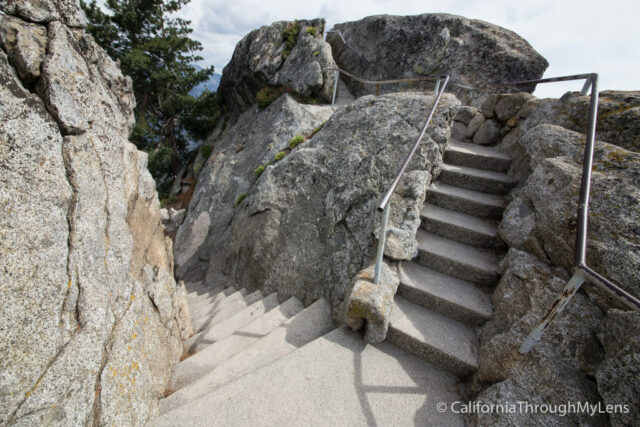 Entire trail is granite stairs and if you are afraid of heights you might want to skip it. 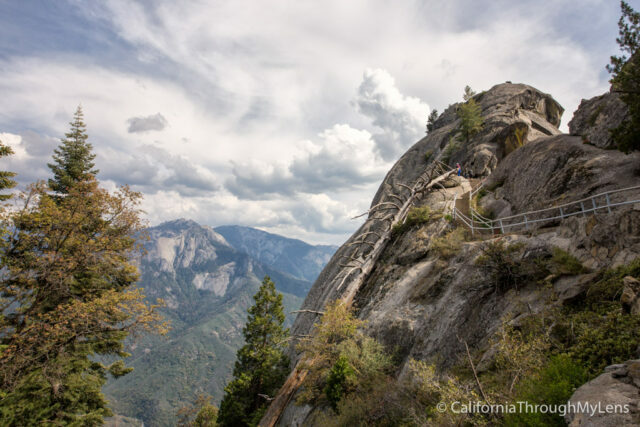 About 30 minutes from the park entrance, after going up the 90 degree turn car switchbacks called a road, you will reach the turn off for Moro Rock. During the summer you cannot drive on this road on weekends and holidays as it is busy and you must use the shuttle. When we went though it was before this time and we were able to drive all the way to the parking lot itself. 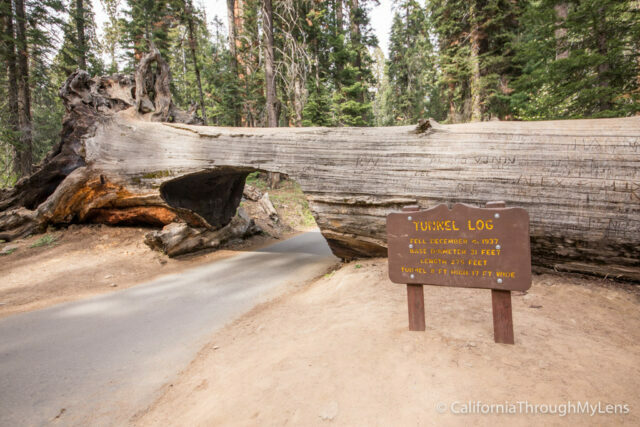 Do make sure to visit the tunnel log when you are there as it is very close to the parking lot and is fun to drive through. 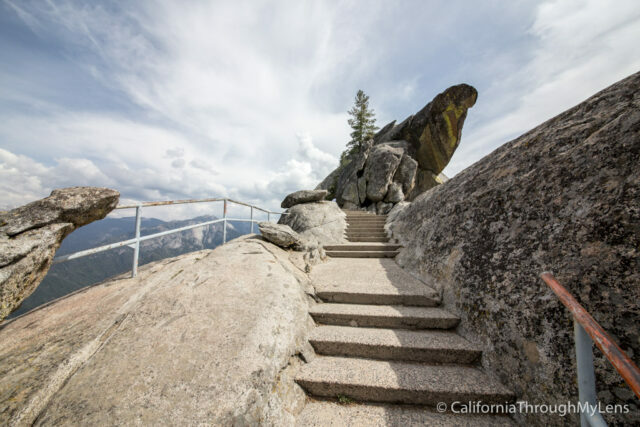 From the parking area you will see the large granite rock right in front of you and no doubt there will be many people on the trail. Be sure to be safe and if the forecast says it will rain then stay away. The trail starts relatively easy with some flat sections and a few sets of stairs. 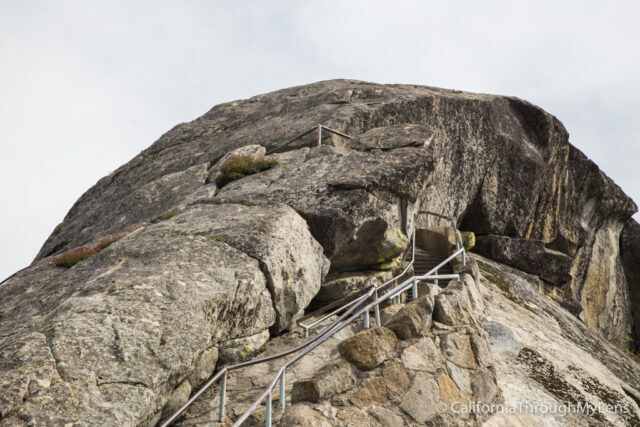 As soon as you head up the rock itself though you will start to see the large drops on each side and begin to feel the elevation. This trail is not difficult though as it is short, just make sure to take your time and you should make it to the top. I saw people of all levels of physical activity and ages climbing up it. The trail keeps heading up and you will soon start to see better and better views. 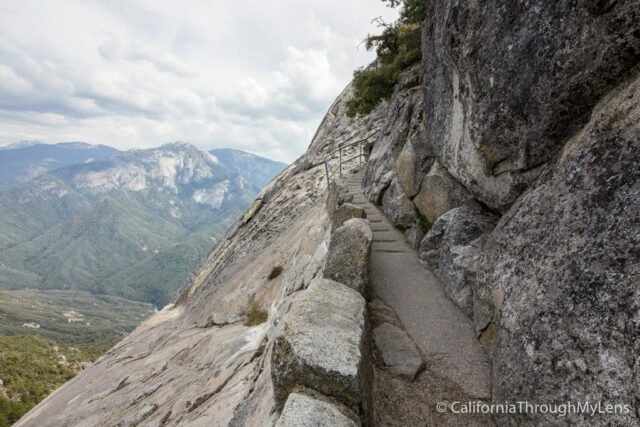 There are even a few sections where you can tell the trail was cut right out of the rock itself as they have tight overhangs that you walk through. Near the top there are a few small switchbacks before you reach a straight section of stairs that takes you to the top of the rock. From here there are safety rails, but make sure to watch your children so they do not get too close to the edge. You are pretty much just standing on a massive exposed rock. This vantage point provides a 360 degree view of the entire valley and it is absolutely amazing. 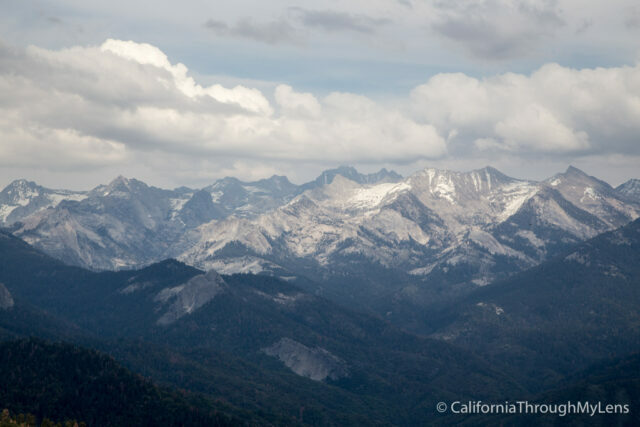 There were snowcapped mountains, lush forests and views that went on for miles. 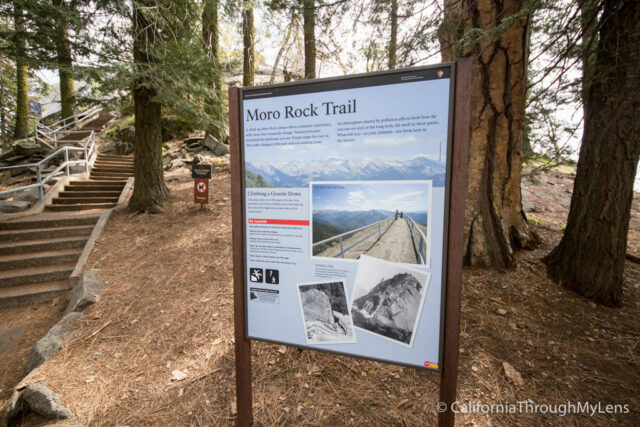 There are a couple plaques that teach you about the area and the surrounding peaks when you are at the top. Like I mentioned before, the road to get up here winds around a lot and I found it fun to see it from this vantage point. After spending some time at the top you simply make your way back down the stairs. It is a little more intense heading down as you can see how high you are, but I am someone who is afraid of heights and I did fine on this hike. 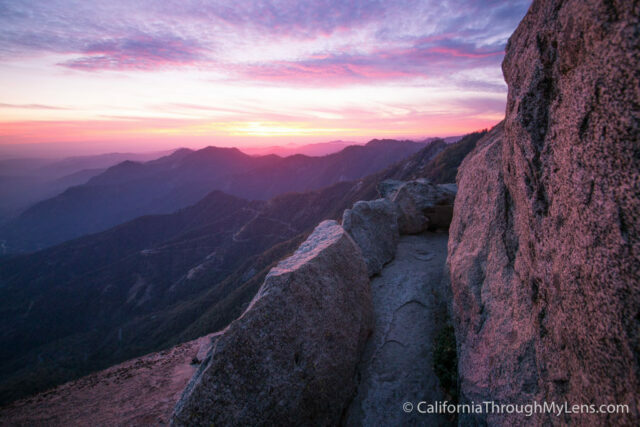 Moro Rock at sunset is one of the best places I have ever seen the sunset at. It was incredibly clear and the colors danced beautifully on the horizon as it changed from yellow to orange to red. It is something I highly recommend you check out while in the park. I would recommend heading up the rock about an hour before sunset is supposed to happen, this will give you ample time to get up the rock itself and set up for your shot. On the top of the rock it is usually pretty easy to find a spot near the railing to set up a tripod and wait for the fun to start. When I was there we had about 15 or so other people up there will us but the top is so big that it isn’t a big deal and there is room for everyone. I would recommend bringing a flashlight or head lamp for the walk down in the dark. 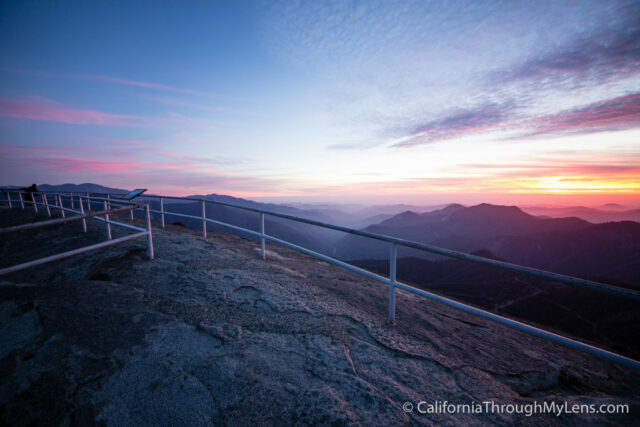 At night Moro Rock is also a great destination in the park. 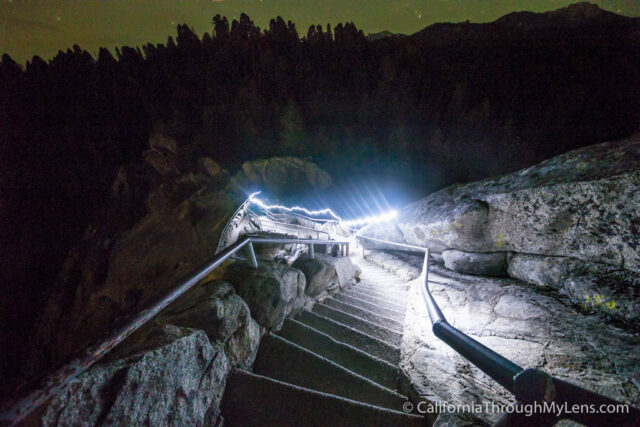 It can be a little sketchy though so only go if you are prepared and make sure to have a flashlight as you do not want to navigate the steps without one. You can see a light trails shot of going up the stairs below. When you get up to the top I would recommend setting up the tripod and working on your settings. 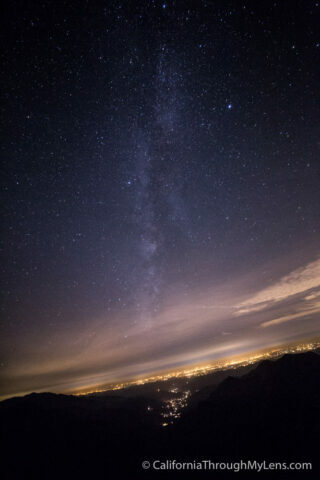 I like to shoot a few shots towards Fresno as it can be awesome to see the milky way above it if it is the right time of year. 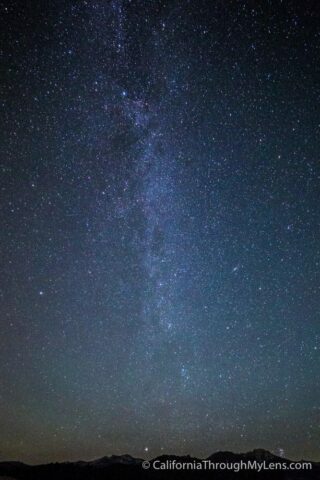 Also, the view over the Great Western Divide is awesome as well, and has less light pollution so you can see the stars better. I also tried testing out a few headlamp shots as this was a good spot for it. After you are done grab your light and start making your way down the rock. 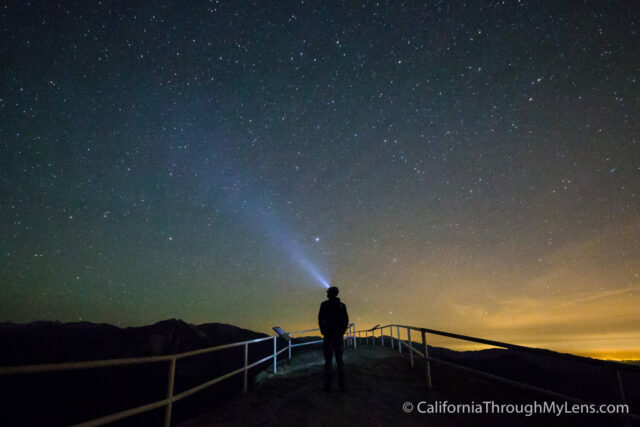 I would recommend bringing a friend with you on the adventure as it can be a little remote at night-time. 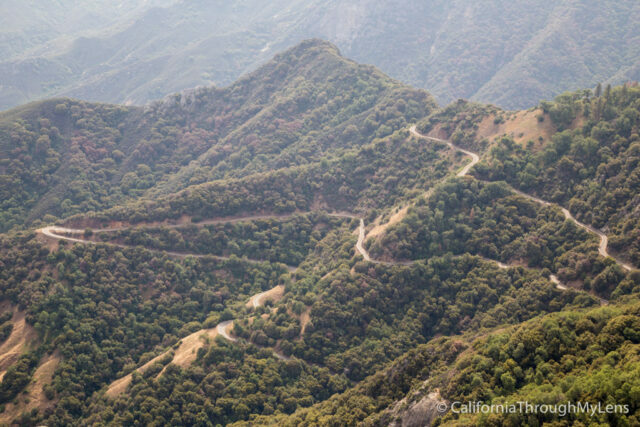 Overall this is one of the best short hikes you can do in California, it has adventure, views and a workout. Make sure to add it to your list and let me know in the comments if you have been.